The 2018 Hartman Rabbinic Torah Study Retreat drew 170 participants from the US, Canada, Israel, Europe, and Latin America. 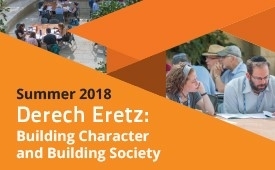 Summer program participants conducted a timely exploration of character development and ethical leadership in the Jewish tradition at a time of the demise of civil discourse, widespread cynicism about democratic principles, and misbehavior by flawed leaders. Topics included how Jewish values help us to inculcate virtue in ourselves, in our leaders, and in our society and how religion can contribute to confronting current challenges? Click on the video player above to watch all RTS 2018 videos. Click below to watch individual programs and lectures.